5 lace yarns Uni + 1 skein free - 600g - (08-54-55-57-23-18) - white, pastel pink, baby pink, pink, rose, amethyst. Fiber Content: 50% cotton 50% polyacrylic. 5 lace yarns Uni + 1 skein free - 600g - (61-81-63-75-64-39) - beige, gravel, mocha, nut, brown, chocolate. Fiber Content: 50% cotton 50% polyacrylic. 5 lace yarns Uni + 1 skein free - 600g - (03-58-02-76-59-90) - candy, fuchsia, brick, raspberry, blackberry, malaga. Fiber Content: 50% cotton 50% polyacrylic. 5 lace yarns Uni + 1 skein free - 600g - (85-91-13-22-12-01) - riviera, jungle, green melted, absinthe, ocean green, opal. Fiber Content: 50% cotton 50% polyacrylic. 5 lace yarns Uni + 1 skein free - 600g - (60-25-52-06-53-18) - cream, lavender, heather, violet, lilac, amethyst. Fiber Content: 50% cotton 50% polyacrylic. 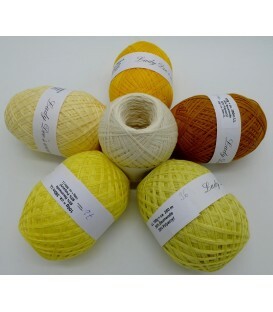 5 lace yarns Uni + 1 skein free - 600g - (60-77-72-36-05-33) - louvre, vanilla, curry, lemon, caramel, cream. Fiber Content: 50% cotton 50% polyacrylic. 5 lace yarns Uni + 1 skein free - 600g - (21-42-34-68-09-16) - light gray, steel, medium gray, anthracite, black, khaki. Fiber Content: 50% cotton 50% polyacrylic. 5 lace yarns Uni + 1 skein free - 600g - (11-20-83-69-31-38) - pea, pistachio, leaf green, frog green, fern green, fir green. Fiber Content: 50% cotton 50% polyacrylic. 5 lace yarns Uni + 1 skein free - 600g - (26-28-41-24-45-66) - salmon, lobster, cherry, red, brick, burgundy. Fiber Content: 50% cotton 50% polyacrylic. 5 lace yarns Uni + 1 skein free - 600g - (30-43-07-51-50-44) - dragon-fly, ciel, pigeon blue, gentian, capri, petroleum. Fiber Content: 50% cotton 50% polyacrylic.